Not only is Fox working on a new robot movie based on an Isaac Asimov book, but the studio's got a real life NASA technician writing the script. 20th Century Fox seems to have finally realized that robots are cool. Only seven years after the major box office success of I, Robot, the studio has been revealed to be working on a new movie adaptation of one of sci-fi god Isaac Asimov's books. 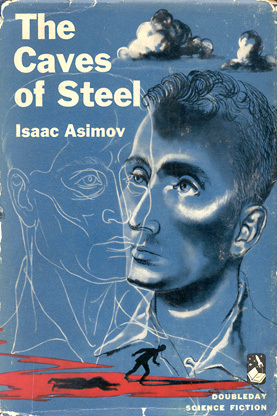 This time around, the story is The Caves of Steel, which is part of the author's famous Robot series. The Caves of Steel is a murder mystery that takes place 1,000 years in the future, on an overpopulated Earth where there is a phobia about robots. The title refers to giant city complexes that are necessary because Earth is so overpopulated. While robots are used for labor in outlying "spacer worlds" where the rich live on spacious parcels, the robots are outlawed on Earth. A Spacer Ambassador lobbying to loosen Earth's anti-robot restrictions is found dead, his chest imploded by an energy blaster, and a detective is matched with a human-looking robot to solve the crime. Hobson and Scott already have some experience together, as the two of them are currently working on a project called Maggie, which tells the story of a 16-year-old girl who transforms into a zombie over the course of six weeks and continues to live with her family (spoiler alert: hijinks ensue). What could be really cool, though, is how these two men's backgrounds combine for the sci-fi film: Hobson is trained as a graphic designer and garnered acclaim for the titles he designed in Sherlock Holmes, while Scott builds command systems for NASA's X-ray satellite, which takes photos of X-ray photons way out in space. It doesn't get much nerdier than this, folks (and that's meant as nothing but a compliment). The Caves of Steel is certainly a great premise for a sci-fi film. That said, seeing as Fox's last Asimov film was I, Robot, it seems safe the movie won't be the most faithful adaptation of the man's story.